Within your Settings module, you have the ability to add and edit Contract terms. AgriDigital have 5 standard GTA Contract terms available for your use, these have been updated to best reflect the industry practice. · Domestic GTA terms (GTA 2, 3 and 4) have been updated to state that prices are quoted GST exclusive. The terms read: “All prices are quoted GST exclusive”. · Export GTA terms (GTA 1 and 5) remain the same, not being quoted as GST exclusive. This allows you to create a Contract with custom terms and conditions that don’t include statements about GST, or industry, statutory or government levies. 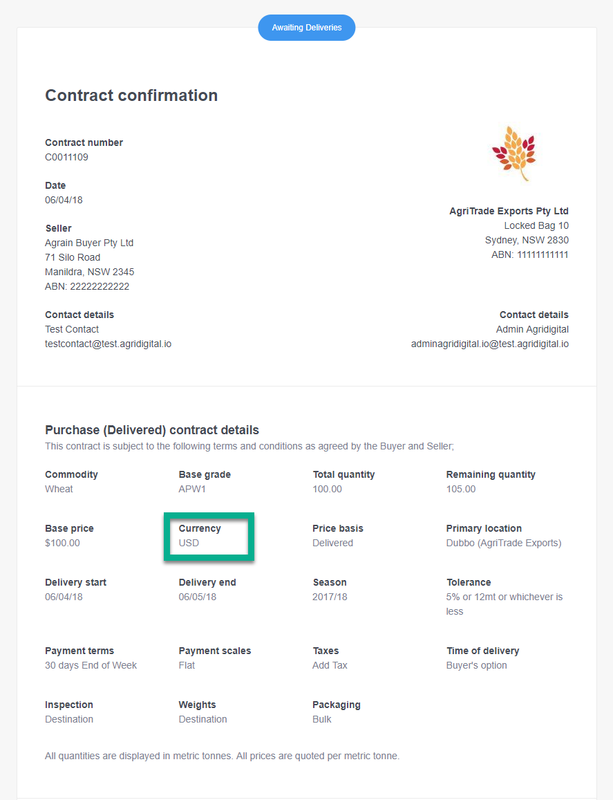 The Contract form now displays the Contract Currency on the details page, making it clear to your counterparty the full terms of the contract payment. For example, the currency will be shown as “USD”.